Winged Eyeliner the easy way! 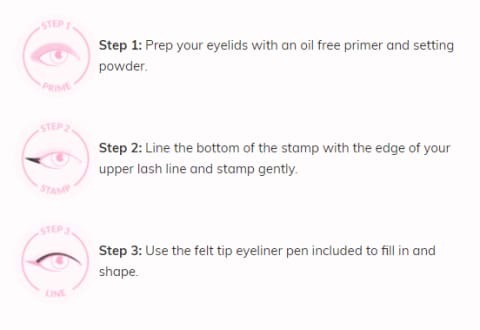 Stamp and Line in seconds for wing perfection! Make them green with envy and enhance your eyes with this emerald shade of green. It's flashier than our original intense black but not too bold that it feels out of place wearing it during daylight hours. Green Envy is dark enough to accentuate your lash line and make your eyes look bigger, but still light enough to make your eyes pop! Each Quick Flick pack comes complete with two dual ended eyeliner pens. Each pen includes a perfectly shaped wing stamp (one for the left eye and one for the right) as well as two felt tip eyeliners to complete your cat eye look. Ensure you store your pens horizontally to allow even ink flow and keep away from heat or air for long periods of time. Easy as 1, 2, Wing! Water, glycerol, tapioca starch, Green Tea pigment, ethoxylated hydrogenated castor oil, behnyl alochol, pullulan, sorbitol, trehalose, Panax Ginseng root extract, Oleaeuropaea (Olive) fruit oil, arginine (plant based).